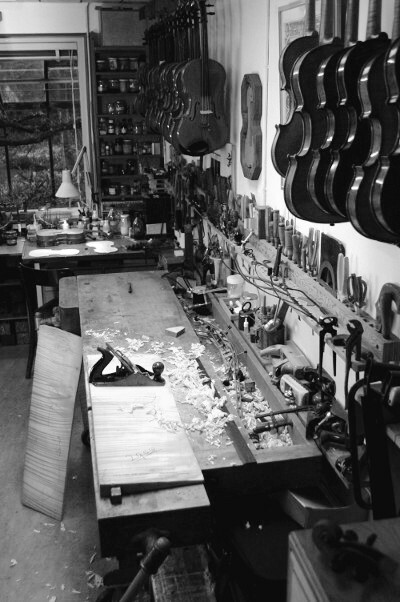 Jeroen Elswijk builds violins, violas and celli by his own model and also copies Stradivarius or Guarneri models. Next to learning the practical know-how of building a violin, Jeroen also made a research into the acoustic properties of violins, and how these properties can be influenced by different building techniques. A publication of Carleen Hurtchins (violinmaker in the U.S. and co-founder of the Acoustical Society of America) stimulated him to do further research of the acoustic properties of all bowed instruments. He also gains inspiration from his contact with violinists and from old instruments that are brought to him for restaurations. He finds that a brilliant 'e' string, open and round 'a' string, warm 'g' string and plentiful core makes a violin sounds ideally. Jeroen found his varnish by doing a lot of research of old recipes. He uses an oil varnish based on traditional ingredients. He uses a groundlayer developed by P.G. Schmidt. Jeroen Elswijk learned the art of violinmaking by Paul de Froe. From 1994 he took lessons in building violins, violas, cellos and double bases. There, he also learned various restauration techniques. After his studies he began to work at the atelier of Paul de Froe in Amstelveen, and he continued to work there by himself after Paul de Froe passed away in 2002. His instruments are played in the Netherlands and abroad as well, by young talents, professionals, students and amateur musicians alike. One of his violins is in the possession of the Dutch Music Instrument Fund (NMF). Jeroen lives in Haarlem with his family, where he also set up an atelier and where he spends most of his time making new instruments.